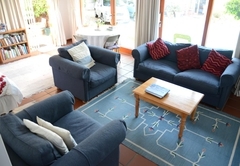 Robin's Nest Rondebosch is a highly recommended property providing self catering in Rondebosch for up to 3 guests visiting the Southern Suburbs region. 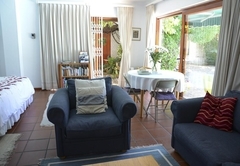 Robin’s Nest is a home from home in the quiet suburb of Rondebosch in Cape Town. The comfortable living conditions, leafy surrounds and convenient location are just some of the reasons both business and leisure guests come back to Robin's Nest. Our proximity to Red Cross Children’s Hospital, the University of Cape Town, Cape Town International Airport and the Central Business District allow our guests easy access to these and other locations. 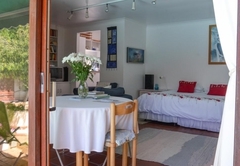 Accommodation is available in a spacious unit separate from the main dwelling, its entrance overlooking a sparkling pool. 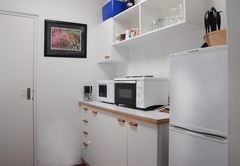 Robin’s Nest has plenty of cupboard space, a well-equipped kitchenette (which includes microwave, oven, stove and fridge), bathroom, three single beds (or double bed option), a double sleeper couch in the comfortable lounge area, a dining room table and chairs, M-Net TV and hi-fi system. Fresh linen and towels are provided and laundry facilities are also available. Secure off-street parking is available immediately outside the cottage, and a remote control for the electric gate is provided for easy access at your convenience. Robin’s Nest offers a sense of 'stay at home' relaxation. Sliding doors open to a paved patio beneath a leafy vined-pergola. Outdoor furniture, a Weber braai / barbecue for guests’ use, swimming, pool-side sunbathing, table tennis and darts invite outdoor living and a range of books and brochures for browsing further encourage guests to linger at home. Robin’s Nest nestles below the slopes of Devil’s Peak, a stone’s throw from Red Cross Children’s Hospital and just a few minutes’ drive to the famous Newlands rugby and cricket grounds. 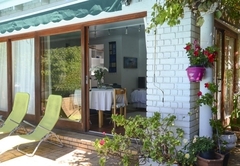 Mowbray or Rondebosch Golf Courses, Rondebosch Common (a national monument), the University of Cape Town, the Baxter Theatre, Newlands Forest and Rhodes Memorial (for many mountain walks) and fine dining at many excellent restaurants between Claremont and Observatory are all within easy reach. 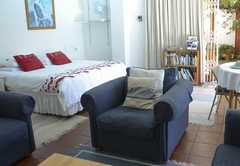 Equally accessible and no more than 10 minutes drive (off-peak) are the Central Business District, the V&A Waterfront and the Two Oceans Aquarium, Kirstenbosch Botanical Gardens, Ratanga Junction and the Canal Walk Shopping Mall (the largest in the Southern Hemisphere) and the Cape Town International Convention Centre, while a further 5 minutes will take you to the marine promenade or sea-front at Sea Point / Green Point or the beaches of Milnerton on the west coast or the cable way station for a comfortable ‘must do” ride up Table Mountain. Separate from the main dwelling, Robin’s Nest has plenty of cupboard space, a well-equipped kitchenette, bathroom, three single beds (or double bed option), a double sleeper couch in the comfortable lounge area, a dining room table and chairs, M-Net TV and hi-fi system. Fresh linen and towels are provided and laundry facilities are also available. Secure off-street parking is available immediately outside the cottage, and a remote control for the electric gate is provided for easy access at your convenience. Robin’s Nest offers a sense of 'stay at home' relaxation. Sliding doors open to a paved patio beneath a leafy vined-pergola. Outdoor furniture, a Weber braai / barbecue for guests’ use. My girlfriend and I had the most wonderful stay here. We booked it for a month and a bit as we were based at Red Cross Hospital. 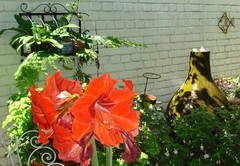 Michelle and Steve are the most caring hosts we have encountered and the house has everything you need! 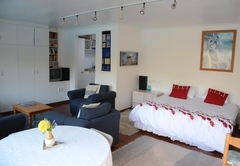 The living room is spacious, beds are comfortable and a fully functioning kitchen. They even have a braai pit! The location is perfect, not too far away from everything and it is in a safe and quiet neighbourhood. I would recommend it to anyone coming to cape town! Wonderful place to stay. Clean and in safe neighborhood. Large bedroom, sitting room, deck. Nice kitchen fully stocked and bathroom. Michelle and her family are exceptionally helpful and friendly. Thumbs up!